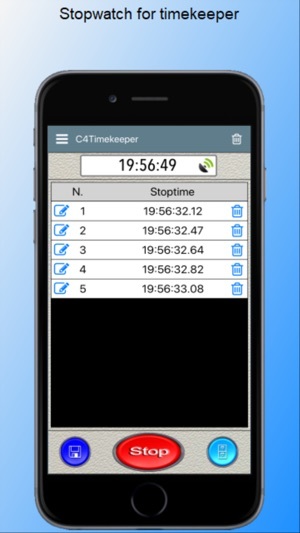 This app replaces the expensive stopwatch of Oldtimer Rally organizer. 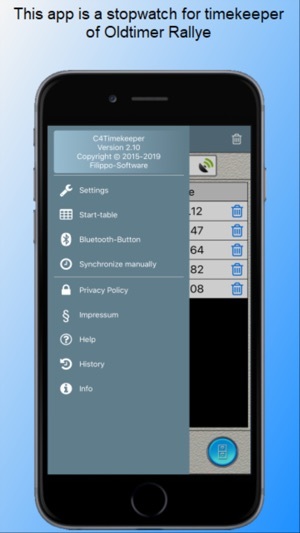 This app can be used by the timekeeper for the secret time control. On the external Bluetooth button (can be me ordered ) a photocell can be connected. A printer is not necessary, because you can send the times by e-mail to the organizers. Thus, need for evaluations, the organizers do not wait until the timer to come back. 2. GPS, using the satellite time. 3. The atomic time, using one of the many global or regional server. You can use for the Stop, the green software button "Start". For the Stop can also be used with an external bluetooth-button. The external button, you can order from me, price see at http://filippo-software.de. * A maximum. 5 times to stop. 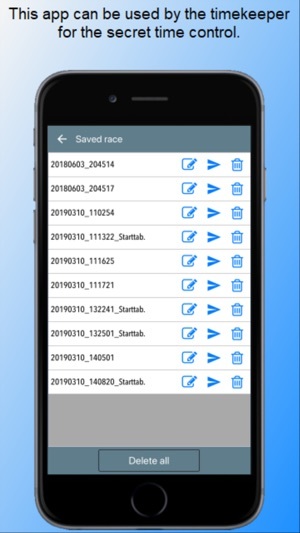 In the start table, the entries can be entered with minutes or half minute intervals.